Crop circles - Electro phytopathology - introduction. Explanation, decipher, decode, discovery, break code, explaining, decryption, puzzle out, scientific research. Here, on this pages will be described for example quantitative methodology for determining the value of electrical energy conducted through, after which there will appear death of a defined mass quantities of plant material, maybe recalculated to the dry matter. Also will be examined and documented for example the determination of lethal doses of electricity for various plant materials, influence of the current passage speed (applied voltage), the behavior of plant material after the passage of sub lethal, above lethal and highly above lethal quantities of electricity, and many other phenomena. Even under very adverse conditions and after lodging (damaging, weakening) may plants before full ripeness enough or almost completely straighten up and deliver undamaged genetic information in high quality grain, although the mechanical strength of straw is in comparison to an undamaged vegetation much lower. Likewise, may happen that the grain just before ripening (wheat phase just before the 89 - full maturity, the plants are almost dry and they have many thousands of times higher electrical resistance than plants in the vegetative stage. There may be induced in their tissues much higher voltages (simplified interpretation), but that already may not in the DNA of germ cell nuclei seeds cause such a great damage, because i may pass in quite another way. There may occur as sad fact that the field is completely lodged (damaged, weakened), but with completely healthy crop, very difficult to harvest. Sometime in the future it would be probably determined the exact stage of plants development, where there in plants the lightning discharge-induced energy causes the most damage, and act accordingly to that. All that is still of course a mere assumptions and theory. From the point of view of practical and experimental agriculture and botany is possible to classify the consequences of electrity to herbal plants between abiotic stress factors (other e.g. excess or lack of moisture, light, oxygen, deficiency of CO2, minerals, exposure to high or low temperatures, mechanical stress). Their influence is sometime also very slow, visually observable many days from the beginning. Furthermore, the consequences of electricity are in some cases visually almost identical to those of herbicides, that are sorted between biotic stress factors. The onset of their effect also lasts minimally for several days, even in the case of plants, that were affected by the dose highly over the lethal limit. Processes, described in previous paragraphs, of course, may happen also over any other agricultural site, where are not grown crops, able to bend down after damage, because their anatomical structure prevent them from that - potato, tomato, beetroot, sugarbeet. 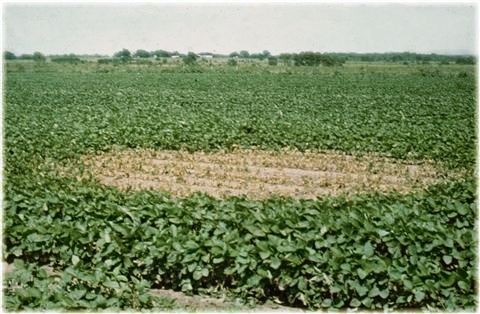 Example of damaged cotton vegetation due to the electricity from the lightning discharge on the left image. Source from IPM Images (Integrated Pest Management), a joint project of: The Center for Invasive Species and Ecosystem Health (link), Colorado State University (link), USDA National Institute of Food and Agriculture (link), Southern Plant Diagnostic Network (link), The University of Georgia (link) - Warnell School of Forestry and Natural Resources (link) and College of Agricultural and Environmental Sciences (link). 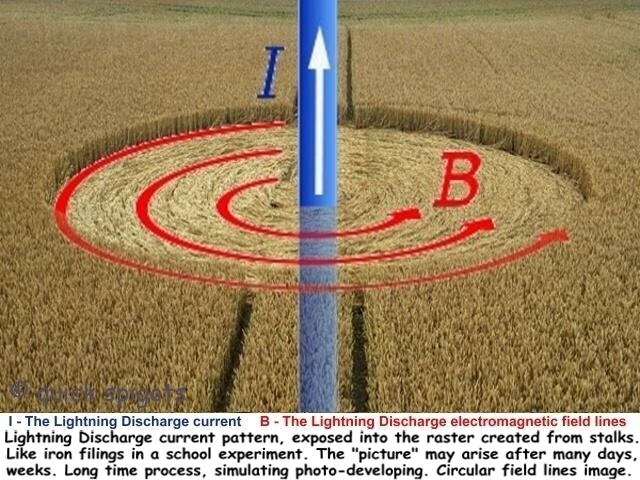 This is a snapshot from a serious agricultural research, no absurd and crazy delusions of crop circles observers. After a longer time interval from the lightning discharge can be observed damage to plants or their complete destruction - dead, usually in a shape of a circle. It is possible to read in a literature about such cases, examples listed in the subpages Sci-Re, agriculture. Many similar cases have been in the past, recorded by crop circles observers, and quite erroneously diagnosed as a result of action of an incomprehensible forces. Here only a few samples, some more in named links and on some other pages, also possible find much, much more in professional and scientific agricultural literature, journals and magazines. Next image on the right shows lightning damage in soybeans, from Soybean Disease Atlas (see), non parasitic diseases, as published in cipm.ncsu.edu (CIPM), the web of The National Science Foundation Center for Integrated Pest Management, North Carolina University (web). Again, circuar shape of damaged plants, with a sharp border. One another, really serious published paper about soybeans, with interesting text and some photos, named Soybean "Mystery" (see), Emerson Nafziger (link), possible find at the web of University of Illinois, illinois.edu, Integrated Pests Management, ipm.illinois.edu. The most important ideas of this article is that lightning consequences in agricultural fields may appear time to time quite differently: "Lightning probably does not strike the same way in all cases". Also, confirmed again: "Lightning can cause symptoms that might in some cases look like a disease, such as phytophthora with its dead tops of plants". The right photo of lightning damage in soybeans. Published in Plant pathology (see), published on the web of Oklahoma State University (see), Division of Agricultural Sciences and Natural Resources, see. Alike on many others photos possible see quite sharp, circular shape of damaged plants, created around the center of the lightning hit point. Lightning Injury to Plants (link) - University of Hawaiʻi at Mānoa web, College of Tropical Agriculture and Human Resources - CTAHR. 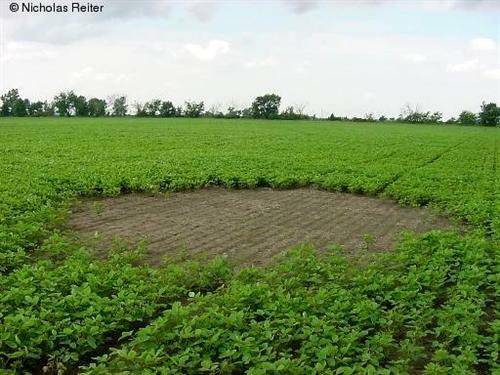 Soybeans - search "Lightning Damage" on the page. Ministry of agriculture, food and rural affairs, Ontario, homepage. 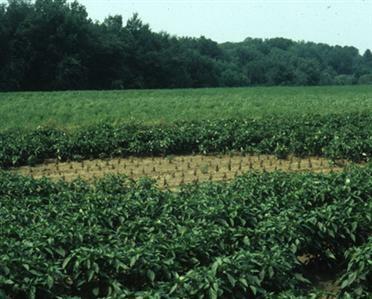 Potato - University of Nebraska, Lincoln (UNL), Nebraska crop production & pest management information (CropWatch). "The size of the affected area relates to soil moisture and strength of the discharge. Most commonly the area struck by lightning is circular or ellipsoid with a well demarcated border." 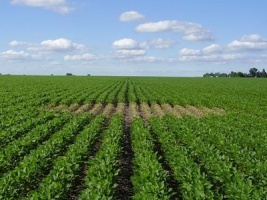 ... "If soil moisture varies considerably in the area, damage may be irregular. At first glance, the area may seem to have been attacked by a pathogen such as black leg or stem canker." 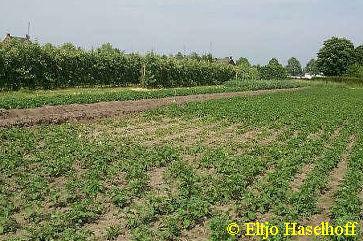 Bad patches in beet crop - link - Rothamsted Research, agricultural research station (web). "Lightning ... produce a roughly circular patch, a few metres across, of dead and sick plants. 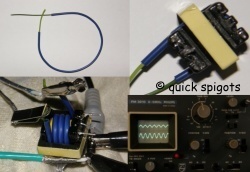 If the lightning is forked, several smaller patches may be produced." Compendium Compendium of beet diseases and insects, E. D. Whitney, James E. Duffus, American Phytopathological Society (APS), p. 57: "Lightning may kill or damage beet. Death of plants usually occurs in a circular pattern around the site of lightning strike: the severity of the damage is greatest at the center and decreases as the distance from the center increases." Strawberry - The essential garden guide - web. Sugar crops - Science in farming, plant diseases. On the left side placed another photo, showing consequences of lightning into a field of pepper. Possible to click the photo to follow the link. Source - Soil, Crop & Pest Management, Diseases and virus management (link), part of the web of University of Massachusetts Amherst, UMassAmherst (web), Center for agriculture, Massachusetts (link). On the photo is possible to see again, very typical, very sharply defined, damage to the vegetation in the shape of a circle. Another very interesting text is possible find in Sunflower Production Handbook 2007, see. There is very characteristic note about grass - poaceae, like almost all cereals. Web of National Sunflower Association, NSA. "the fact that both sunflower and weeds (not grass, however) are killed". Grass - Poaceae, like almost all cereals, note J.L. Rather, it survives a large percentage of affected individuals Poaceae plants, and will ripen, though with visible damage. This ability is related to high density sowing. Also possible read there, again: "Lightning damage sometimes is mistaken for a disease". In the above text given three examples about only one plant species - sugar beet, one next about the sunflower, one other about potatoes, one common, and some others. Possible find thousands professional agricultural articles on internet, and tens of thousands, hundreds of thousands in printed science books, texts, articles, journals, magazines, textbooks. In almost every one of them is a note about relatively sharply bounded, circular or elliptical shape of plants, damaged after lightning discharge. Further highlighted that the damage is apparent mostly up to several days after the lightning, sometime more than a week. Want more? 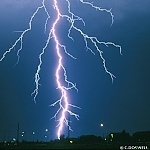 Farmers know very well that the effects of lightning discharges may be by amateurs easily mistaken for anything else - plant and animal pests, lack or excess fertilizer, the effects of drought, wet, high or low temperatures, see literature. There is also everywhere sufficiently reliably described how to safely differentiate hit by lightning from other similar damages. Most commonly by that the damage after a certain time, do not spread on vegetation. It is also often observed that on the affected areas they can start causing all sorts of other pests, but later on, only as a secondary phenomenon. Just as well farmers know that the consequences of individual lightning strikes in the fields of cereals may in individual cases very considerably vary one from another. This fact is in literature also quite in detail described. So rather just for fun, our dear agriculturists, leave all that dilettante "explorers" of crop circles, continue fumble in their delusions. 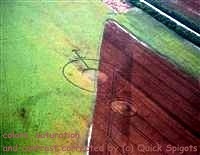 Many similar cases have been in the past, by observers of crop circles actually recorded, and quite mistakenly regarded as a result of action of incomprehensible forces. It is of course mainly due to the fact that as from the point of agriculture and botany, are crop circles observers in the vast majority total dilettants, let alone in some professional plant sciences, such as phytopathology. Here is a small insertion, for comparing. Three photographs, illustrating the "
. Sevenum, Limburg, Netherland, 30th July 1999. Ontario, Essex County, Canada, 24th July 2004. Argentina, Santa Fe, 29th December 2009. Similar photos may be found in the collections of dozens, just search. Is possible find many other photos, that are very strikingly similar to that three in previous text, above this paragraph ‑ red pepper, soybeans, cotton - clearly identified as the effects of lightning. Probably depends primarily on that, who attend such similar site first. In case of serious agricultural worker or researcher, rather than document and mentions it in some publication dealing with the effects of lightning strikes in monocultures of field crops. Soybean diseases. Cabbage. Lettuce. Mr. Bean. Corn. Another soybeans. Diseases of truck crops and their control, J. J. Taubenhaus, PhD fulltext, online, observations on potatoes by Jones and Gilbert in 1915 (! 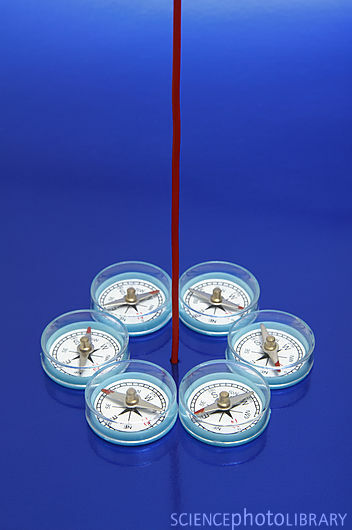 ), fig. 12a. On page 74: "No evidence of splitting or mechanical rupture of the stem has been observed." Page 75: Jones and Gilbert's explanation of the phenomenon: "When an electric storm breaks suddenly following a period of dry weather and the first rain wets the topsoil, there remains a layer of dry earth between this wet surface and the moist soil underneath, which is a poor conductor of electricity. When the lightning strikes the wet surface spot, it disperses in all directions, horizontally and then downwards into the earth, following lines of least resistance. The plant stems and roots with their abundant water content are better conductors than the layer of dry soil just mentioned, and so the electric current passes through them. The tissues may thus be variously injured or killed, depending upon the amount of current passing through them." This is a very accurate description of some principles and effects, participating during the emergence of crop circles. It was written round 100 years ago. Monthly weather review, (Monthly weather review, docs.lib.noaa.gov, NOAA - National Oceanic and Atmospheric Administration), March, 1915 (! ), p. 135, Lightning injury to cotton and potato plants, By L. R. JONES and W. W. GILBERT. Agriculturists recognised, that lightning will create after some time circular damages on a herbaceous field with any common vegetables or cereals. Corn, grain and grass exhibit noticeably higher resistance to electricity from lightning against other cultivated plants. Monthly weather review, (Monthly weather review, docs.lib.noaa.gov, NOAA - National Oceanic and Atmospheric Administration), August, 1920 (! 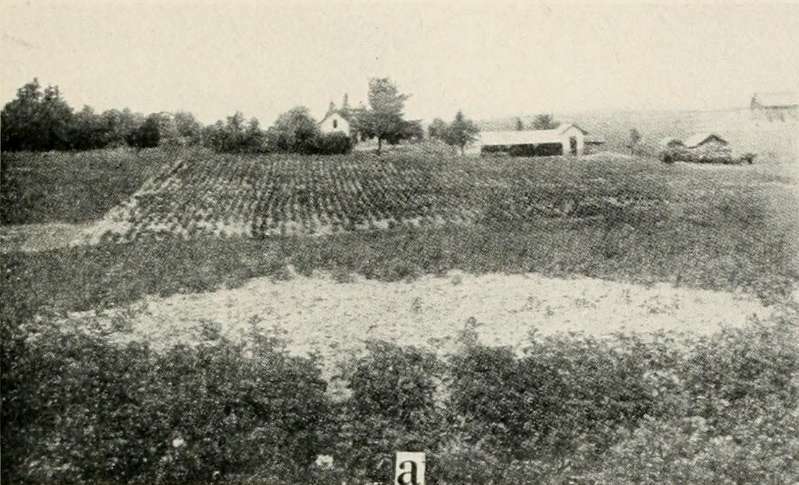 ), p. 452, Observed lightning injury to potatoes. Next more notes about lightning damage on herbaceous fields.